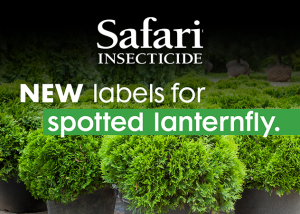 Morrisville, N.C. (March 19, 2019) – Nufarm Americas announced that Safari® 20 SG Insecticide has received a 24(c) label for the control of spotted lanternfly in New York. This follows 2ee label approval to control spotted lanternfly in 15 states: Connecticut, Delaware, Kentucky, Maine, Maryland, Massachusetts, New Hampshire, New Jersey, North Carolina, Pennsylvania, Rhode Island, Tennessee, Vermont, Virginia and West Virginia. The spotted lanternfly is an invasive plant-hopper quickly invading, and now spreading in, the northeastern US. The pest impacts more than 70 host plants and, if infested, would result in significant damage and loss to nursery operations. Safari 20 SG supplemental labels are approved for use in containerized and field grown (in-ground) ornamental plants in nurseries, outdoor landscapes, tree plantations and reforestation nurseries. It includes national, private and state forests and wooded areas. The label provides application alternatives that include foliar spray, media drench, soil drench or basal trunk spray. Safari is a super-systemic insecticide with quick uptake and knockdown of tree, shrub, and herbaceous ornamental pests. It controls a broad spectrum of invasive pests including Q- and B-biotype whiteflies, emerald ash borers, mealybugs, leafhoppers, leafminers, and armored and soft scales — and now both nymph- and adult-stage spotted lanternflies. To learn more about Safari® 20 SG nufarm.com/usturf/product/safari-20-sg. For a complete list of Nufarm professional greenhouse and nursery products, visit www.nufarm.com/usturf. For specific application rates, directions, mixing instructions and precautions, read the product label. ©2019 Nufarm. Important: Always read and follow label instructions. As a leading supplier to the Greenhouse and Nursery Ornamental market, Nufarm’s US Turf and Ornamental team delivers a portfolio of products meeting the value, efficacy, and innovation demanded by the market to solve the daily pest and disease issues you face. Trusted products such as the 3336® brand family, Affirm™, Safari® and TriStar® have been your go to products for years and innovative solutions such as Cuproxat®, Spirato® GHN, and SureGuard® SC are more recent Nufarm solutions. An unsurpassed customer service team, coupled with sales and technical resources, all with a mission to solve your problems, sums up the personality of your Nufarm team. We are here to help you grow a better tomorrow, today.